Perovskite solar cells, with a current maximum power-conversion efficiency of 23%, hold much promise for producing photovoltaic energy through devices that are easy and inexpensive to fabricate. Planar cells are composed of a layer made of a light-harvesting material with a structure that goes under the name of perovskite and that is often a hybrid organic-inorganic material. 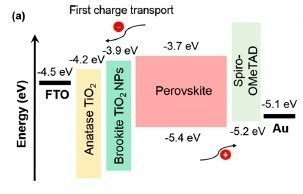 In this layer, the absorbed light generates charge carriers, electron and holes, that are then collected, respectively, in an electron-transport layer and in a hole-transport material, which sandwich the perovskite layer. These two layers are in turn covered with electrodes, one of which is transparent to let the light into the device. Improving the performance of each of these elements is important to maximize the efficiency of the solar cell. The authors used a low-temperature and environmentally friendly technique to prepare highly conductive and single-crystalline brookite nanoparticles that they used to produce heterophase anatase-brookite and brookite-anatase electron transport layers, as well as layers based on single-phase anatase and brookite. To compare the performance of the various electron-transport layers the researchers measured their morphological, optical and structural characteristics, evaluated the interface between the layers and the perovskite, and finally measured the performance of the resulting solar cells. They found that the use of single-phase brookite resulted in a 14.92% power efficiency, the highest performance reported to date for this type of electron-transport layer. The heterophase layers resulted in performances up to 16.82% for the anatase-brookite phase. As the authors comment, "the present work presents an effective strategy by which to develop heterophase junction electron-transport layers and manipulate the interfacial energy band to further improve the performance of planar perovskite solar cells and enable the clean and eco-friendly fabrication of low-cost mass production." On one side of the solar cell there is the first electrode, a transparent conductive oxide, typically fluorine-doped tin oxide (FTO) or indium tin oxide (ITO), followed by an electron-transport layer. On top there is the light-absorbing layer made of the perovskite material - a material with an ABX3 chemical formula, where A and B indicate two positively charged ions, and X a negatively charged ion -, then a hole-transport material and finally the second electrode, which is commonly made of gold, silver or carbon. The electron-transport layer is not always present, but it facilitates the transportation of electrons to the electrode and thus generally improves the efficiency and stability of the device. Md. 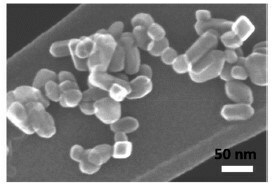 Shahiduzzaman, Sem Visal, Mizuki Kuniyoshi, Tetsuya Kaneko, Shinjiro Umezu, Tetsuhiro Katsumata, Satoru Iwamori, Masato Kakihana, Tetsuya Taima, Masao Isomura, and Koji Tomita, Low-Temperature-Processed Brookite-Based TiO2 Heterophase Junction Enhances Performance of Planar Perovskite Solar Cells. Nano Lett., 19, 598-604 (2019).